Speech Analytics For The Cloud - Live Demo! Get a high level introduction to VoiceBase's speech analytics API solution, use cases and a live demo of our on-the-fly custom vocabulary! Develop your contact center’s cloud transformation strategy using Amazon Connect by AWS and AI-powered Speech Analytics by VoiceBase. Jerry Perkins, Co-Founder and CEO of Symbee, an AWS Consulting Partner and creator of the Symbee Connect SaaS platform for Amazon Connect, and Dan Raasch, Senior Solutions Architect at VoiceBase, will provide professional tips about how to choose the right building blocks for your cloud contact center transformation strategy and how to avoid the pitfalls of moving from on-premise to the cloud. The contact center has been moving to the cloud for the better part of a decade now. It’s not a matter of “if” but “when.” Cloud solutions are open, reliable, scalable, secure and most of all, cost effective. Whether you have seasonal call volumes and only want to pay for what you use, or your sick of paying service fees for hardware that delivers lackluster results; cloud-based contact center solutions provide the best ROI. • Why the time is now. Statistics from multiple industries demonstrate that the move to the cloud is irreversible, fully in flight, with no signs of slowing down. Do not get left behind. 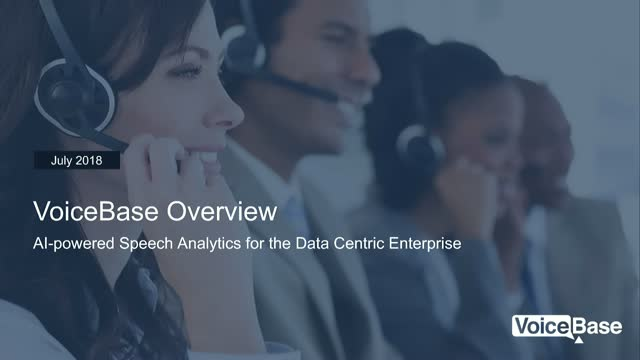 Learn how AI-powered speech analytics can be leveraged in your Amazon Connect powered contact center to better monitor agents and increase sales. Take a deep dive into omni-channel customer analytics as we address the common challenges of implementing a modern call center Quality Assurance program and how CustomerView, an omni-channel customer analytics platform can enhance your customer’s satisfaction, improve sales, and reduce churn. • How to implement 100% agent QA and automate call scoring, script compliance monitoring, 100% NPS, and top agent performance modeling. • How to unlock the important data within your contact center calls, web, chat, social media and other customer touch points to improve business performance and boost customer satisfaction. • The costs and risks of not having a contact center agent quality assurance strategy. • The complexities and limitations of legacy customer analytics systems. Join us as we demonstrate how PerformLine has converted speech analytics insights into world class compliance solutions leading the emerging RegTech industry. Now businesses can achieve omni-channel compliance with one turn-key solution. Utilize industry leading speech recognition and speech analytics to instill confidence in customers that their data is taken care of. VoiceBase is defining the future of deep learning and communications by providing unparalleled access to spoken information for businesses to make better decisions. With flexible APIs developers and enterprises build scalable solutions with VoiceBase by embedding speech-to-text, conversational analytics, and predictive analytics capabilities into any big voice application. VoiceBase’s customers include Amazon Web Services, Home Depot, Twilio, Nasdaq, and HireVue. Title: Speech Analytics For The Cloud - Live Demo!